Have you ever wanted your own miniature Chuck D or Flavor Flav action figure? Well, now you're in luck, thanks to Aggronautix. Public Enemy action figures are now available for preorder! You can get a four-piece set featuring Chuck D, Flavor Flav, Professor Griff and Terminator X for $59.95. The action figures were designed by Ed Piskor, author of the comic Hip Hop Family Tree. 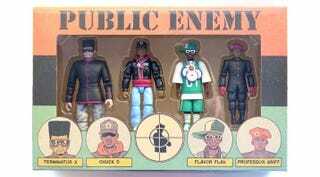 Preorder your Public Enemy action figures (via Aggronautix). In honor of the action figures, here's a throwback to the infamous "Fight the Power" video.